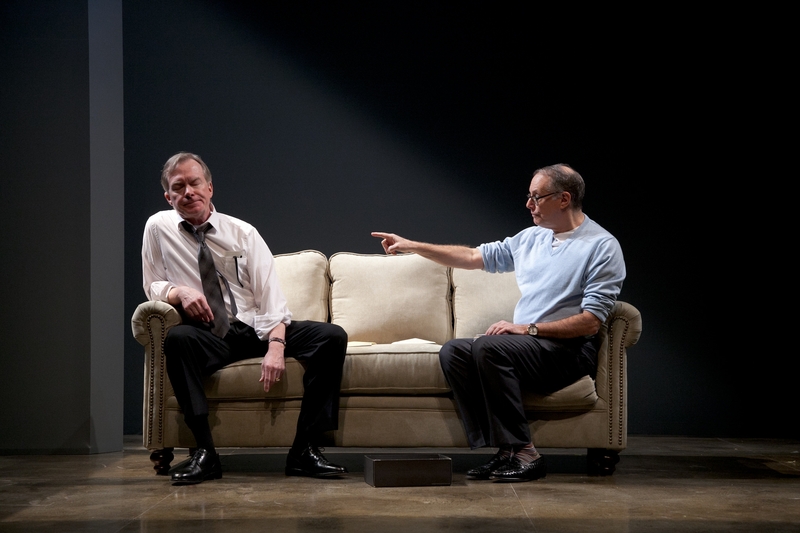 Michael Canavan and Bill Kux in “The Best Brothers,” by Daniel MacIvor, at Merrimack Repertory Theatre January 8 – February 1, 2015. Photo by Meghan Moore. LOWELL — The Merrimack Repertory Theatre’s Nancy Donahue Theatre is a warm, intimate space, and smaller shows or solo performances don’t get lost there. It’s the ideal space for something such as Canadian playwright Daniel MacIvor’s “The Best Brothers,” a funny, charming two-hander about two ever-squabbling brothers, the love of a mother and the four-legged animal that helps the family to heal. Michael Canavan is Hamilton Best, a fairly-buttoned-down married architect, and Bill Kux, seen recently in the Huntington Theatre’s production of “Ether Dome,” is Kyle Best, a gay, outgoing real estate agent who, like the characters in Mamet’s “Glengarry Glen Ross” is always closing, but in a kinder, gentler way. The 90-minute piece opens in the wake of the tragicomic death of their mother, 80-year-old Bunny Best, who has run afoul of a float in Toronto’s Gay Days parade, where she was flattened by the combination of a hefty drag queen and a speaker that both fell off the float at the same time. That is playwright MacIvor’s way of setting the stage for comic scenes involving such rites of death as writing the obituary (How best to describe the way she died? Should we serve fancy sandwiches?) or delivering the eulogy at Bunny’s funeral, when Kyle, who is supposed to deliver a short introduction, yanks the rug out from under Hamilton’s carefully-rehearsed tribute. There is a generous amount of back-and-forth that rings of the old Smothers Brothers routine (“Mom always liked you best”) and in this case, it appears Bunny just might have learned to love Enzo, her Italian greyhound, best. There are scenes where Canavan is playing Bud Abbott or Dean Martin to Kux’s Lou Costello or Jerry Lewis, as with a scene at the wake where, in Hamilton’s words, Kyle treats the event like a “cotillion” as he blithely hands out business cards and socializes with friends as a somber Hamilton accepts condolences. But when Kux threatens to lose touch with reality, Hamilton reins him back in or, at least, threaten to punch him in the throat. Both actors will also step back from time to time, don a pair of white gloves and a red hat to inhabit the character of their mother, enlightening the audience on her life in a variety of ways: her husband’s walkout when the boys were young, her feelings about her sons (“I didn’t love Kyle more — just harder”) and a succession of lovers and boyfriends who always seemed to come up short. Bill Clarke’s minimalist set offers a series of blank walls to denote a condo or church with just some furniture and a podium to play off of. Eventually, the character of Enzo — the Italian greyhound Bunny decides to purchase after realizing how lonely she is — enters the picture without being seen. Enzo will go on to first raise havoc in Bunny’s life before the day when he first comes when called, and Bunny falls in love. Enzo again will raise havoc — this time in Hamilton’s household, where Enzo’s destruction of the couple’s prized kitchen precedes the decision by Hamilton’s chef wife to leave him. Enzo will change households again and a poignant scene in a dog park with new owner Kyle will show that despite the tumult after Bunny’s death, Hamilton, Kyle and Ezno have all managed to find a measure of peace. MRT Artistic Director Charles Towers, who directed, keeps the boys grounded and focused and prevents the duo from making the characters too broad or taking them out of bounds. “The Best Brothers” is a series of small pleasures, thanks to MacIvor’s writing and wit and the comic timing of the two principals. The Merrimack Repertory Theatre production of Daniel MacIvor’s “The Best Brothers.” Directed by Charles Towers. Set design by Bill Clarke. Costume design by Arthur Oliver. Lighting design by Dan Kotlowitz. Sound Design by David Remedios. At The Nancy L. Donahue Theatre. East Merrimack Street, Lowell, through Feb. 1. http://www.mrt.org.